Limestone caverns form when slightly acid groundwater seeping through limestone rocks dissolves a hole in the rocks. Over time the hole increases in size forming caves that are sometimes miles long. The ground water carries the dissolved calcite away in solution and deposits it in other caves as a variety of limestone formations. Water dripping into the cave evaporates and calcite dissolved in the water precipitates out to form travertine. Stalactites are icicle-like formations that hang from the ceiling in limestone caves. Below the growing stalactite is a stalagmite. Stalagmites grow from the ground up as the travertine crystallizes on the ground. Flowstone forms when the groundwater flows down the surface of a cavern wall. Some limestone caves are immense. The mapped passages in Kentucky's Mammoth Cave National Park are over 370 kilometers (230 miles) long. The March 1991 issue of National Geographic Magazine includes spectacular pictures of Lechuguilla Cave which was discovered in 1986. 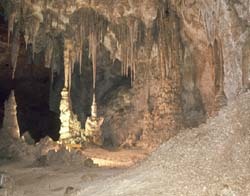 The cave is located five miles away from the Carlsbad Caverns in New Mexico. Limestone Caverns Learn how limestone caves form and where you can visit some of them.